Keeping track of hunger levels throughout the day is one of the easiest ways to determine if you're in the Zone. Our food journal comes with our Zone Nutrition and Portion Guide to quickly teach you how to balance your plate and how to measure your food. A Zone balanced meal is the key to keeping your hormones in check and hunger at bay for up to 6 hours. 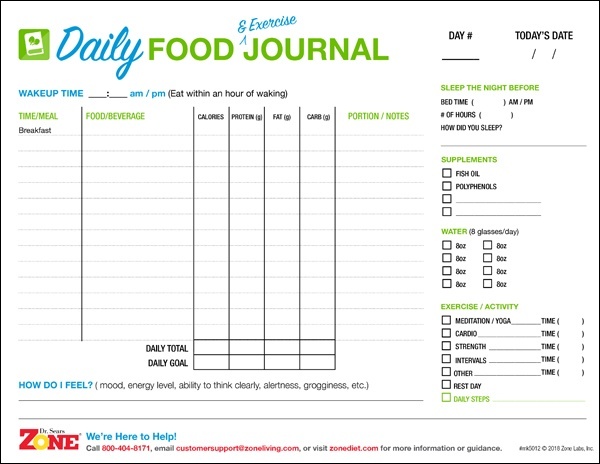 Studies show that those who keep food journals are more successful in sustaining good eating habits which lead to success in other areas of wellness. Studies also reveal that those who document their food and beverage intake may lose more weight than those who don’t. Complete the form to download your Zone Diet Food Journal and Portion Guide.